A beam is a horizontal element of structure that carries weight mainly through tension. Beams bear or sit on columns or walls to transfer the weight from above to below. Loading a beam causes the top of the beam to be in compression (under the source of the weight) and the bottom in tension. Beams carry roofs and floors. Small beams over doors and windows are called lintels. Beams that project beyond the column (free of support) are called cantilevers. Cantilevers can be 1/3 of the length of the beam. A rule of thumb for beams is that they need to be ½ their span deep. In ancient times, a horizontal structure was called the entablature and had three parts: architrave (main beam); frieze (cross beams and ornamental sculpture) and cornice (overhanging crown). Beams were originally made of wood, stone or marble, but today are made of steel, concrete and glass! Beams carry and transfer weight. How do beams react when loaded with weight? Using simple materials from around your house (toilet paper tubes, pieces of paper, plastic cups), construct experiments to learn how beams react to loads, to see tension in action, and to learn how loads are transferred from above to below. Stand two empty toilet paper tubes upright on the floor approximately 8” apart. Place an 8 ½” x 11” piece of paper on top of the two tubes allowing for approximately 1” overhang. First take an apple and place it in the middle of the beam; see how the paper beam immediately collapses, bending in the middle. The top of the paper is in compression and the bottom is in tension. Next take the same piece of paper and fold it like an accordion with 1” folds. Now place the paper beam on top of the two tubes allowing for approximately 1” overhang. Replace the apple carefully in the middle of the beam and see that the paper beam can now carry the apple! The paper beam is stronger when it is folded and can carry more weight. Take a 15 minute walk around your neighborhood with a digital camera. Take pictures of as many different beam types as you can find. See if you can find an entablature, a lintel, and a cantilever. Print your beam pictures, identify the material if possible, name as many parts as you can and label the pictures neatly. Label bearing areas, places of tensionandcompression, and overhangs or cantilevers. Which structural force involves stretching? What three parts does the entablature have? 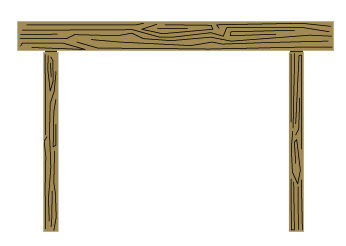 A small beam over a door or window is called a lintel.